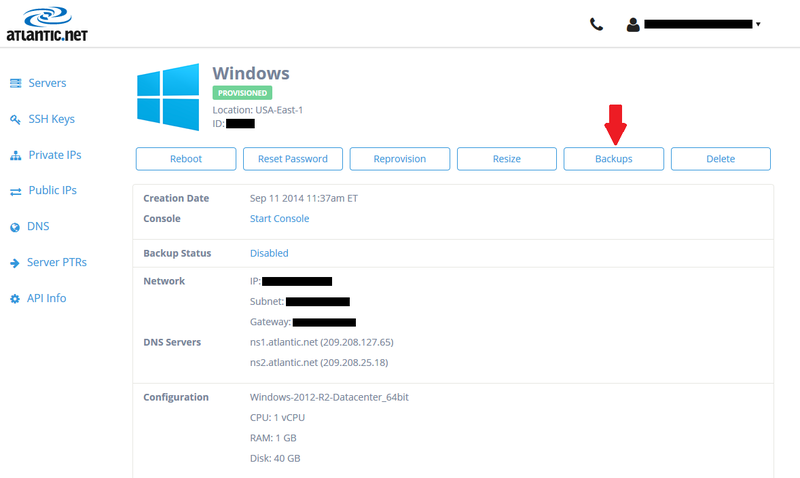 In this article, we will be going over how to rollback your server. Rolling back a server can be helpful when you have experienced performance issues, and the server will not boot or operate as it should. This process is similar to a system restore on a computer where the system will revert the settings to a point in time where the issue is no longer present. Here, we will review how to complete this process. You will need an Atlantic.net cloud server with backups enabled. Please refer to the articles “How To Create A New Atlantic.net Cloud Server” as well as “Does Atlantic.net Offer Data Backup For My Cloud Server” for more information. 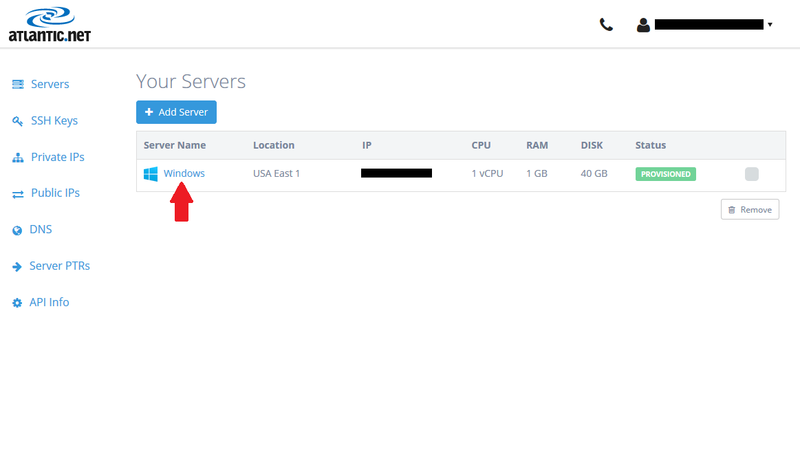 In order to rollback your server, first log in to your Atlantic.net account and click on “Servers” from the left-hand side, as shown below. Once done, a window will display with a list of all the active servers on your account. You must click on the server you want to perform the rollback on from this list. 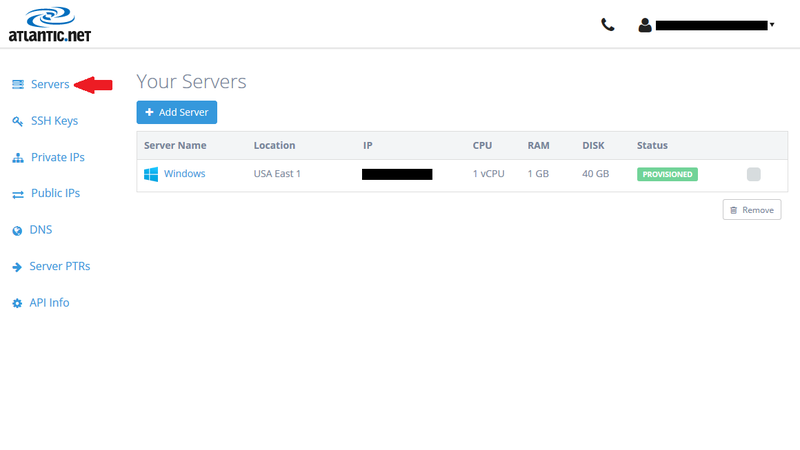 After you have selected the desired server, the network information for that server will be displayed. Click on the button that reads “Backups” on the upper right-hand side. Lastly, you will be presented with a list of available dates from which you can revert your settings to. Scroll through the available rollback dates, and select a desired restore point from the drop-down box. 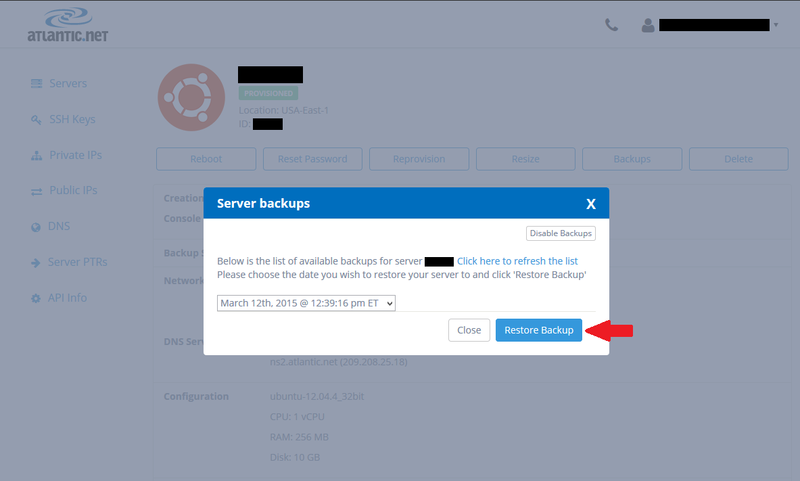 Once you have chosen a date, click on the “Restore Backup” button. This will revert the server’s settings and once completed will reboot the server. The server will once again be accessible. Having backups for your cloud server is a good feature to have enabled, as it can be used as a last resort to correct any issues the server may be experiencing at the time. Check back for more updates from Atlantic.Net, or learn more about our HIPAA compliant database hosting options.